The collection includes feature films such as Oh Brother, Where Art Thou, Memoirs of a Geisha, and Million Dollar Baby; documentaries such as Ken Burns’ The War and Al Gore’s An Inconvient Truth; many PBS broadcasts such as The State of the Planet’s Wildlife and Martin Luther; musicals such as Brigadoon, The Wizard of Oz, and The Sound of Music; collections of television shows such as Inspector Morse, Upstairs Downstairs, and MacGyver; operatic performances and film adaptations of dramatic works. DVDs are found near the Research Help desk. 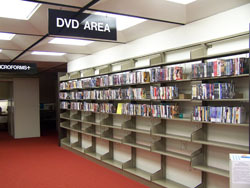 The most recent additions to the library collection are shelved at the end of the DVD area on the "New DVDs" shelves. VHS tapes are found at the far end of the Main Floor computer lab. 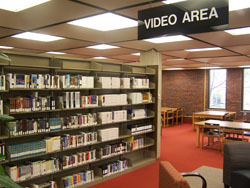 All items in the DVD and Video areas are searchable in WorldCat Discovery, the library catalog.